Atlantic South Region: North Georgia Pickleball Club - the ladies compete this time! 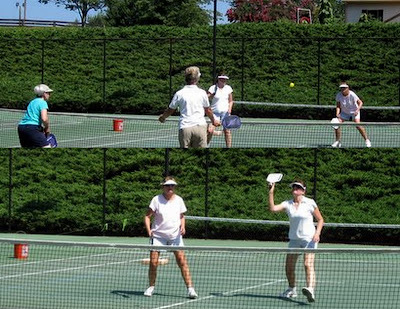 North Georgia Pickleball Club - the ladies compete this time! Now, I did inquire as to who the "twins" were in the club. " What do you mean - Judy and I don't look alike... OK - Of course I should have known." Didn't you see the movie "Twins" with Danny Davito and Arnold Schwarzenegger?" Ann says it was a hard fought match, but she and Judy were beaten soundly 11-3. Here are the "twins " winners standing behind the Club's banner: Left to right: Ann Earley, Judy Vonesh, Pat Dunn and Pamela Ridge. Congratulations ladies!! And after the match Pam finds some tired pickleball players, enduring the heat and humidity: Judy Vonesh, Steve Dunn, Ken Riordon, Pat Dunn, Ann Earley, Tom Earley and Bocce, our pickleball mascot. Now - rumor has it that Tom Early has one of those "significant" birthdays coming up in about a week. I'm not going to get in any trouble by telling you which one!! But I understand the pickleball club will be celebrating with a catered dinner, singing and karaoke. and a gourment specialty cake from "Chocolate Fix".All pickleball players are invited to attend in the appropriate 50's or 60's attire. And then stay tuned as we draw closer to their Annual Fall Pickleball Tournament!! !